Wall coat rack ‘ideal’ (model no. 110) designed by Mathieu MATEGOT for ARTIMETA in the 1950s. This is the big version of this coat rack. 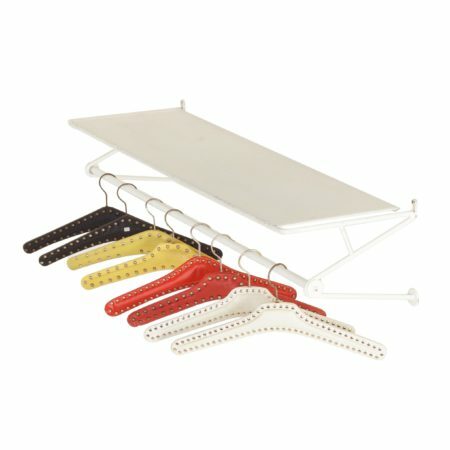 We have added some colored coat hangers from the fifties in the colors red, yellow, black and white. The coat rack is made of metal, perforated, bent and folded. Given the age, this mid century Mategot coat rack in good condition has once again been painted white. Source: Artimeta’s advertisement from the Goed Wonen magazine (1961, no. 5, page 9) and Mathieu Mategot. Price is for the coat rack including the colored coat hangers.